Shutters with a tier on tier design look super in this property in Ealing. The window is a large bay with a natural break where the window has separate openers at the top. Tier on tier is a style for your shutters where the shutter panel has an actually split at a point in the shutter panel across the horizontal. This split can be manufactured up and down the panel at a point which suits your window. By matching this split to the top of where the windows’ natural break is, or where the window changes, the split will match up and you will have a split and not see the framing of the window when the top tier of shutter panels are opened back. 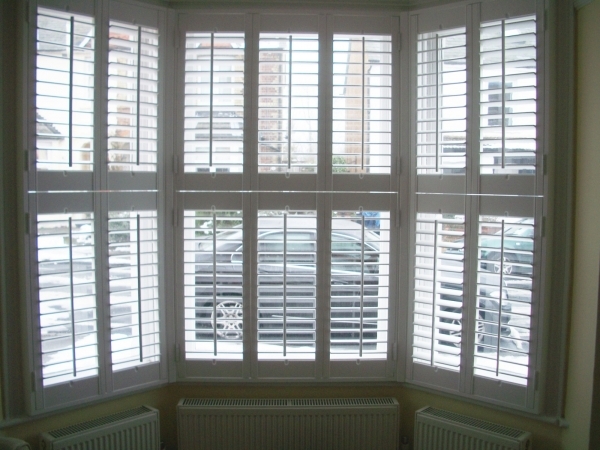 This tier on tier shutter design in Ealing is super for when you are trying to achieve more of a privacy effect with your shutters. The top tier of shutter panels can be opened up to allow lots of light to flood into the room, whilst the bottom tier of shutter panels can remain closed and the slats can be tilted wide open to let light in, or the slats can be tilted to diffuse the light that comes in, or the slats can be tilted upwards to that privacy is maintained. Shutters from Shutterly fabulous are made bespoke for each customer. This is great as not everyone’s windows are precisely the same. There is literally no such thing as a standard Victorian bay, or a standard sized Georgian sash. All windows will differ slightly, even if its just by a few millimetres, this is often found in new builds too. If the window recess has been excessively painted, or is out of square, the dimensions can differ by a few millimetres which is enough to cause the shutters not to fit.